American Friends of the Medem Library, Inc. Supporting and promoting the activities of the Paris Yiddish Center and the Medem Library (Bibliothèque Medem, Maison de la Culture Yiddish), the oldest and largest Yiddish library in Europe. The Medem Library was founded in 1929 in Paris, France by Eastern European immigrants and members of the Medem Union, a league of Yiddish writers and political activists. Today, the Medem Library houses nearly 21,000 works in Yiddish and 9,000 in other languages. During World War II, portions of the Library were miraculously saved from destruction by Medem Union members and hidden in the basement of the orginal building at 110, Rue Vieille-du-Temple, Paris. After the war, the Library was overseen by various Yiddish groups intent upon preserving the Library for scholarly reserach. During the 1990s, holdings of other French Yiddish libraries were incorporated into the Medem collections. Finally, in 2002, the Paris Yiddish Center-Medem Library was formed with the merger with the Association for Yiddish Studies (AEDCY), crowning the Medem Library as the foremost Yiddish center in Europe. Since the formation of the Paris Yiddish Center-Medem Library, a number of important new Yiddish dictionaries and Yiddish books have been published. The Center is also host to numerous cultural activities and language courses throughout the year. The Yiddish Dialect Dictionary will be the first complete dictionary of the Yiddish language covering all dialects and all periods of the language, from the Middle Ages to the present day. Besides definitions, users will find the entire phraseology with example sentences drawn from the literature, hear the words as pronounced in the different dialects, trace the history of the words back to ancient times, and see maps illustrating where the words were once used in Europe. The dictionary, which will be freely accessible online, aims to make the whole wealth and variety of Yiddish available to everyone at the push of a button. 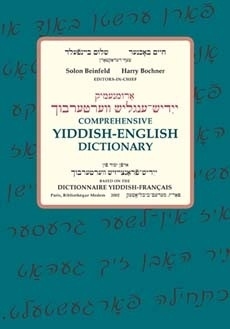 Learn more and contribute at https://yiddishdialectdictionary.com/, or via paypal by clicking on the button below. Please indicate that your donation is for the Dialect Dictionary in the box "Add a note to accompany your donation." Click here for more details or go to the dictionary's website: www.verterbukh.org. Read Itsik Gottesman's review in the Forverts.